Surrounded by olive groves and fruit trees, located on the edge of Sarola, in the hinterland of Imperia-Oneglia, this detached stone cottage offers a refined ambiance in country house style. It is a well maintained family-home in a quiet area with its private garden, sunny terrace and beautiful views of the surrounding valley and hills. The living space of approx. 95 sqm net extends over two floors: an apartment of approx. 75 sqm on the ground floor and a studio of approx. 20 sqm below. Since the house is built on the hillside, there are entrances on both floors. The main entrance on the ground floor leads into a spacious hallway with fireplace and from there to the various rooms: to the left into the well-equipped kitchen with pantry and a spacious living-dining room, straight ahead into the bedroom and the bathroom, right hand to a sunny, sheltered terrace and in another living room, which could also be used as an additional bedroom. In the basement there is a laundry and a large storage room of about 12 sqm, as well as a one-room apartment with bathroom - ideal for guests or older children! 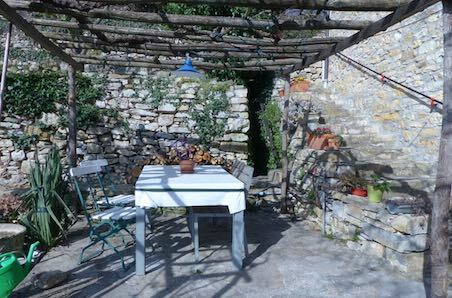 Here is also the access to the sunny terrace with an arbor and seating area and to the garden. The easy-care garden of about 100 sqm, offering beautiful views of the surrounding countryside, is planted with some fruit trees, vines and herbs. 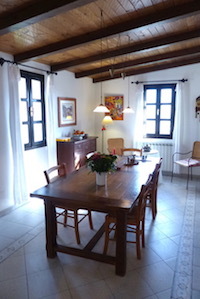 The country house is located on the edge of Sarola next to a narrow lane, where only motorcycles can pass. The nearest car park is about 120 meters away. The small village of Sarola, which belongs to the municipality of Chiusavecchia, consists of about 70 buildings, an agriturismo and restaurant and is located about 8 km away from Imperia with its beaches and modern marina. An expressway, which leads also to several large shopping centers, provides quick and easy access. Nice and Genoa airports are about 100 km away.